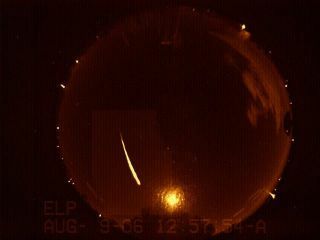 2006 Perseid Meteor Shower: Jim Gamble photographed this "nice, bright and long magnitude -8.6 Perseid" using an all-sky camera at the El Paso Station of the Sandia All Sky Camera Network. Each summer in the Northern Hemisphere, amateur astronomers from all over the world look forward to observing the famous Perseid Meteors, but often overlook six lesser showers that reach their peak between July 28 and Aug. 20. This year, a bright full moon will interfere with the Perseid meteor shower, but that doesn't mean skywatchers should miss out on viewing the other six, all but one of which will enjoy dark skies. In fact two of these minor meteor showers, the Delta Aquarids and the Alpha Capricornids are active this weekend. Anyone gazing at the night sky these nights for even a short length of time is likely to spot a few "shooting stars" darting across the sky. In general, the Earth encounters richer meteoric activity during the second half of the year. So any meteoric particle generally must have an orbital velocity greater than that of the Earth to "catch" us. However, after midnight when we are turned onto the Earth's "leading” side, any particle that lies along the Earth’s orbital path will enter our atmosphere as a meteor. As such, objects collide with our atmosphere at speeds of 7 to 45 miles (11 to 72 kilometers) per second, their energy of motion rapidly dissipates in the form of heat, light, and ionization, creating short-lived streaks of light popularly referred to as "shooting stars." The only equipment you'll need is your eyes and a modest amount of patience. The actual number of meteors a single observer can see in an hour depends strongly on sky conditions. Astronomers measure the brightness of objects in the sky on a reverse magnitude scale, with the lower magnitude numbers corresponding to brighter objects. The rates given in the table are based on your ability to see stars as faint as magnitude +6.5 – considered to be the threshold of naked eye visibility – that you are an experienced observer, and an assumption that the radiant is directly overhead. For comparison, Sirius (the brightest star in the sky) shines at a magnitude of –1.44. The radiant is the place in the sky where the paths of shower members, if extended backward, would intersect when plotted on a star chart. Your clenched fist held at arm’s length is equal to roughly 10 degrees on the sky. So if the radiant is 30 degrees ("three-fists") above the horizon, the hourly rate is halved; at 15 degrees it is cut to a third. While the hourly rates from these other meteor streams are but a fraction of the numbers produced by the Perseids, combined, overall they provide a wide variety of meteors of differing colors, speeds and trajectories. This table shows list of the minor summer meteor showers for 2010 and the best times to view them. Full Story. Among these are the Southern Delta Aquarids, which can produce faint, medium speed meteors; the Alpha Capricornids, described as "slow, bright, long trailed yellowish meteors" and the Kappa Cygnids which are classified as "slow moving and sometimes producing brilliant flaring fireballs." As such, if you stay out and watch long enough, you may be nicely rewarded for the time spent. Note that five of the six showers listed, come from the region around the constellations of Aquarius and Capricornus. These constellations are currently highest in the southern sky between roughly 1 a.m. and 3 a.m. local daylight time. The moon will have already set earlier in the evening, leaving the after-midnight skies dark for the Southern and Northern Delta Aquarids, Alpha Capricornids, and Southern Iota Aquarids. As for the Kappa Cygnids and Northern Iota Aquarids, the moon will be waning in illumination, but will still shine at a relatively bright gibbous phase, which will unfortunately brighten the predawn morning sky. Of these six minor showers, the Kappa Cygnids are the most favorably placed for northern observers: the constellation of Cygnus lies high overhead at around midnight making it favorably placed for viewing all night long.